Get £5 by using the promo code NOMAD when signing up for Curve! Once in a while you come across a product you had no idea that you needed, yet overnight it becomes an indispensable tool. For me, one of those products is Curve. Since it does so many different things, it’s hard to summarize it in a single sentence. The official tagline reads “all your cards in one,” but that’s not even close to covering all the benefits a Curve card can offer you. The headline benefit of Curve is that you can replace all your credit and debit cards with only one card. 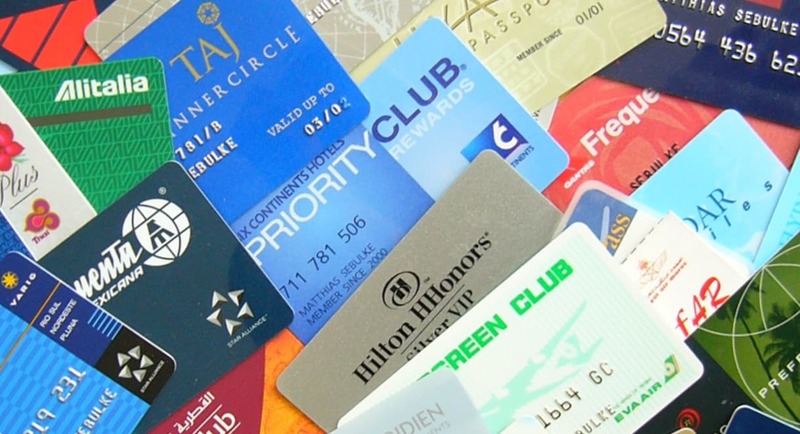 Most of us—especially frequent travelers—have at least a few different credit and debit cards. Instead of carrying them all with you at all times, you can add all your Visa & Mastercard credit, debit and select prepaid cards to Curve. Then just pick which card you want to have active in the Curve app. Can Curve really replace all my credit and debit cards? I generally recommend to always carry one Visa and one Mastercard, in case one of the networks experience issues. Personally, I carry a Curve Mastercard and a Chase Sapphire Reserve Visa credit card. For certain transactions where a large sum is temporarily blocked on your card (such as when renting a car with insurance excess or paying for fuel at the pump), Curve is less than ideal. It will still work, but the blocked amount will be debited from your selected payment method. It will be refunded once the block is removed, but due to the way card networks work, it may take a few days before showing in your account. Only American Express cards issued in the UK are currently supported, but the Curve team is working on supporting Amex cards from the rest of the EU/EEA soon. While many digital neo-banks offer features like push notifications and budgeting features, most brick-and-mortar banks and credit cards still don’t. Note that, similar to Revolut, Curve adds a 0.5% (for $/€/£) to 1.5% fee (for other currencies) on weekends to protect against currency fluctuations while the markets are closed. We all regret some life decisions from time to time—like that final tequila shot last night. Luckily with Curve, accidentally charging an expense to the wrong card is no longer something you need to regret. If you change your mind, just click the Go Back in Time button in the app for up to 30 days after a transaction took place and select which card you want to move the charge to. Few things are more annoying than having your wallet stolen—especially while traveling. But if you only carry your Curve card you just have one card to re-order. The same goes in case your card details are exposed in a large scale hack (like the 2013 Target data breach), you would also just need to re-order one card. Real-time transaction alerts also make it easy to notice fraudulent activities on your card. Plus, if you lose it (or think you did)—you can lock your Curve card instantly with a single tap in the app. And unlock it with another tap if it turns up again. Crisis averted! If you need to replace a debit/credit card while you are traveling, you can simply add the updated card details to your Curve app—instead of waiting for the card to be shipped to you on the other side of the world. You can even add virtual card numbers (which many banks now issue for spending online), and spend using those in stores anywhere in the world. Finally, instead of trying to remember the PIN codes of all your credit and debit cards, you only need to remember one. No sticky notes in your wallet required. There are quite a few credit cards around the world that will let you earn frequent flier miles, cashback or other rewards when paying for goods and services. However, usually, these cards charge high foreign exchange fees, typically 3%. So in all but exceptional circumstances, it’s a terrible deal to use those cards abroad. But by using the card through Curve and letting them do the currency exchange, you get the true interbank exchange rate. Suddenly, using your rewards cards abroad is a much better deal! How much you can spend in other currencies for free depends on which Curve card you have. More details below. While a few debit cards allow free cash withdrawals, credit cards usually don’t. Besides, credit cards typically charge massive cash advance fees plus interest from the first day if used in an ATM. But due to how Curve works, even ATM withdrawals with your Curve card will look like online transactions to your bank or credit card issuer so they won’t apply any fees! With Curve you can withdraw as much cash as you’d like in the same currency as your card (pro tip: you can change the currency of your card in the app at any time)—spread across 10 withdrawals per month—for free. Additional withdrawals only cost £0.50 a piece. If your underlying card is a credit card, there’s a fair usage limit of £200 per month (you’re charged 2% for any amount above that). With debit cards there’s no such limit. Note: Curve just launched something called a “dynamic MCC engine,” which basically means that they will be able to pass along more details about transactions to your underlying bank. While this is mostly a good change, it also means that your bank might know when you use your Curve card at an ATM and may opt to charge you a fee if they usually charge for ATM withdrawals. If you want Curve to do the currency conversion for you when withdrawing money from foreign ATMs, you get a free quota of £200/400/600 per month, depending on if you have Curve Blue/Black/Metal. No one likes filling out expense reports. 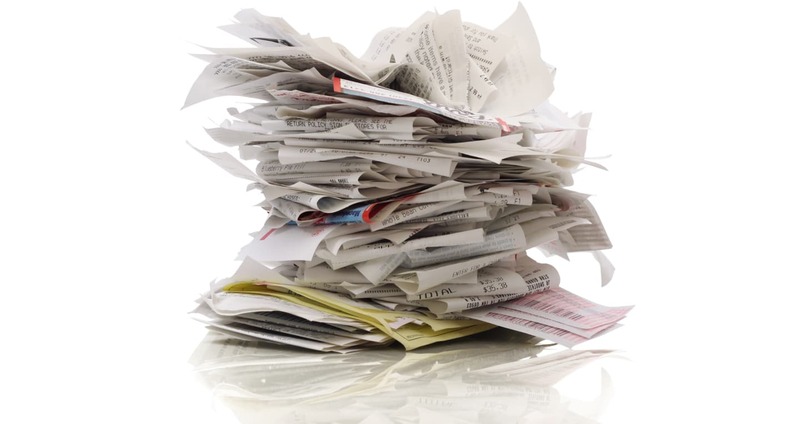 Keeping track of receipts is a bore. And if you lose any, be prepared to say goodbye to that refund. But with Curve, doing your expense reports don’t even feel like work. If you use Xero (more integrations on the way), the transaction and receipt can be added automatically to your accounting system. If you use a different system, you can have it delivered to your email, or periodically export a CSV + ZIP file with all your business transactions and receipts. Which card to choose—Blue, Black, or Metal? While all the cards come with all the features I mentioned above, Black and Metal have some extra perks. It comes with all the core Curve features, but often with lower limits and fewer bells and whistles. If you’re not yet sure of the value Curve will provide you, it’s a good product to start with. And for many, it will be more than enough. But if you want something extra from your Curve card, keep on reading. 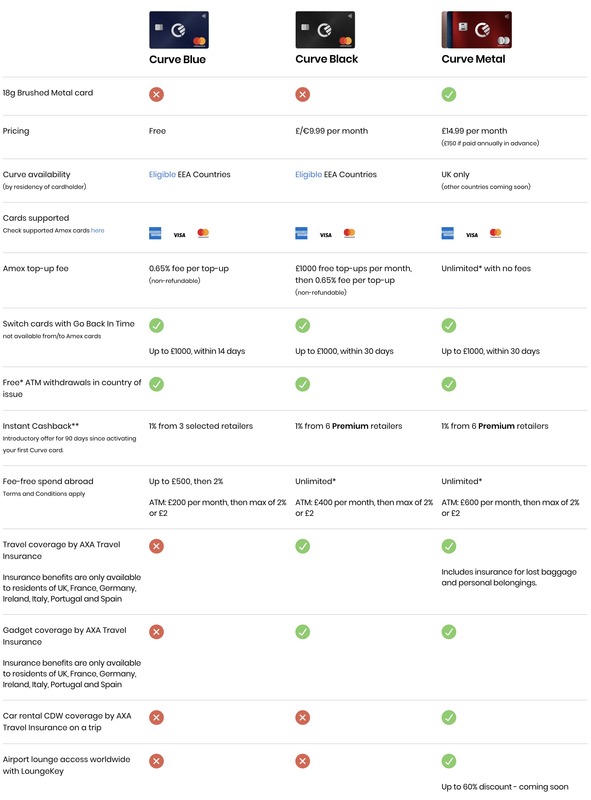 The first major benefit of Black over Blue is that Black comes with a £15,000 limit on free Currency Conversion per year, while Blue only offers £500 per month (after which they add a 2% surcharge). You’ll also get double the amount of free ATM withdrawals in foreign currencies (£400 instead of £200). If your underlying cards charge a foreign transaction fee and you spend a significant amount of money in other currencies, you will probably save a lot of money by getting Curve Black. If, on the other hand, the underlying cards you will use in Curve have 0% foreign transaction fee already (e.g. N26, Monzo, or Charles Schwab) and you mostly spend money in Curve’s supported currencies, then the savings are likely to be more modest. However, there are more reasons why you might opt for an upgrade. With Black, you can Go Back in Time for 30 instead of 14 days. You also get £1,000 free Amex spend per month (it costs 0.65% with Blue). And last, but not least, Curve Black also gives you comprehensive travel and gadget insurance from AXA. It’s a good fit for anyone who makes trips of up to 90 days at a time, and it doesn’t even require you to pay for your trip with your Curve card. Note that currently, the insurance part of Black is only available in the UK, France, Ireland, Italy, Germany, Portugal, and Spain. It should expand to include other EEA countries soon. The most exclusive Curve card is for now only available in the UK but will launch in the rest of Curve’s European markets at some point in 2019. In addition to all the Curve Black benefits, you also get unlimited fee-free Amex use (only UK Amex cards from the start), unlimited 0% FX rate, and even a collision damage waiver insurance (when paying for the rental car with your Curve Metal card). It will also soon include a LoungeKey membership, but the details of which aren’t known yet. The card itself is made mostly of metal (the back is plastic to allow for contactless payments) and weighs 18 grams. It is available in three bright colors; blue, red, and pink. It might prove to be a serious contender for the best metal travel card for UK residents (primarily competing against Revolut and N26). While Curve is a London based fintech startup, you can currently have the Curve card shipped to Austria, Belgium, Bulgaria, Czech Republic, Denmark, Estonia, Finland, France, Germany, Hungary, Iceland, Ireland, Italy, Latvia, Liechtenstein, Lithuania, Luxembourg, Malta, the Netherlands, Norway, Poland, Portugal, Romania, Slovenia, Spain, Sweden, and the United Kingdom. Cards will also start shipping to Croatia, Cyprus, Greece, and Slovakia at some point during 2019 (so go ahead and reserve your card now). Curve has launched a lot of new features in the past year, and it looks like the upcoming 6 to 12 months will be just as interesting. Apple Pay, Google Pay, and Samsung Pay support—meaning that all your bank cards will indirectly support these systems if you connect them to Curve. P2P payments between Curve users. 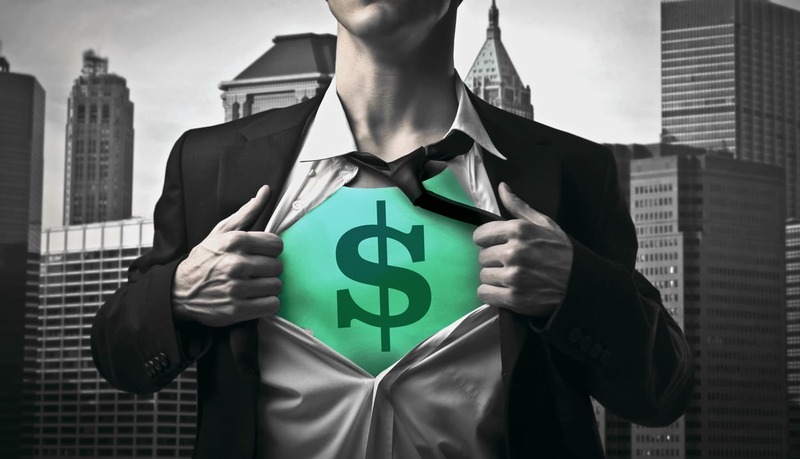 Virtually hand over a funding card to someone else in a controlled and secure way. Curve Credit—convert any purchase made with your Curve card to an installment plan, so you can pay the purchase over the course of several months. Unlimited virtual cards for safer online spending. You can set limits and other rules (like tying them to a specific merchant) for each individual card. Open banking—connect and manage your bank accounts from your Curve app. Hopefully, both Curve Metal and the travel insurance in Curve Black will be expanded to additional countries as well. While Curve is pretty darn amazing already, there’s always room for improvement. I’ve included a handful of feature requests here, in the hope that someone from the Curve team ends up reading this article. It would be great to define my cards with no foreign exchange markup as such in the Curve app, allowing them to be charged in the original currency. Currently, I have to manually change the currency in the app when visiting a new country. ⚠️ This isn’t as much of an issue with the new 0% FX fee, at least if you have the Curve Black card. I’d really love to see a native Expensify integration (that’s what I personally use for expense reports). Virtual card numbers on a per card basis that can be used online (for subscriptions that always should go to the same card). ⚠️ It looks like the virtual cards feature mentioned in the previous section might work in this way, so I might be able to tick this one off soon! If technically feasible, it would be great if Curve would pass the underlying VISA/MC merchant codes of transactions to your bank (e.g., for travel purchases), so you could earn the full amount of points when using credit cards with category bonuses (such as the Chase Sapphire Reserve). ✅ Done! American Express support. ✅ Launched as closed beta, full rollout in the UK expected soon. It might take some time for non-UK Amex cards to be supported. Get Curve right now—and don’t forget your free £5 by using the referral code NOMAD! Have you already tried Curve? What has your experience been like? Discuss below or in the community forums!